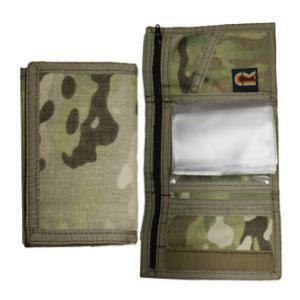 The camouflage trifold wallet has two ID Windows. One on the inside and one on the outside. There is a zippered pocket on the inside behind the billfold pocket. Credit card card slots and a photo insert and included. The wallet has a secure hook and loop closure. MADE IN THE USA.